Discussions Magazine Music Blog: SHE & HIM/Volume Two available March 23rd, 2010! SHE & HIM/Volume Two available March 23rd, 2010! 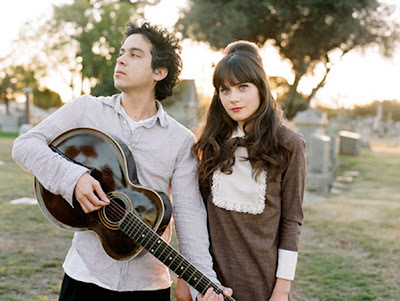 2010 sophomore release from Zooey Deschanel and M. Ward. She & Him make music for an eternal springtime, when the temperature is warm enough to go riding with the top (or at least the windows) rolled down and the radio turned up. They occupy an alternate universe where the saddest of songs feel as warm as sun showers; the rain may be coming down, but somewhere nearby, everything looks bright. What began as a fascinating, no-strings attached collaboration on 2008's Volume One has evolved into a bona fide touring band, and She & Him are here to stay. Deschanel and Ward are as comfortable and complementary a musical pair as Les Paul and Mary Ford; hearing them again on Volume Two feels like getting together with two old friends. This time, the harmonies have grown more angelically layered, the string arrangements more dramatic, the songwriting even sharper and more confident. But as with Volume One, the prevailing mood is bittersweet, dreamy, and romantic.